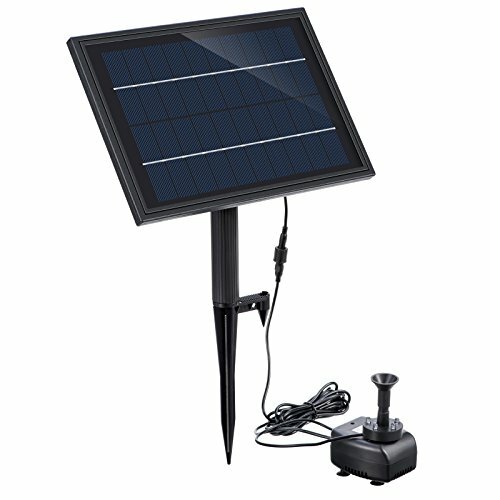 Lewisia Built-in Battery Solar Fountain Pump with RGB LED Lighting for Pool Pond Waterfall Garden Water Feature Battery Backup Solar Water Pump Kit 5W | Fountain City Art Ctr. Note: Please turn ON the switch as the battery only charges in the "ON" position. Be patient with the solar pump & let it charge up for a couple of hours initially before first use. The pump works on battery, but it's not controlled by the switch. When you turn it off, LED/pump both turn off. But if you turn on the switch, LED/pump would NOT turn on immediately. It needs to charege for sometime as the battery voltage is low. Once charged, the voltage gets ok, it would work again. Q: You can feel the vibration of the pump motor, but only a low pressure trickle of water comes out. A: It may be clogged. There are four screws in the bottom corners then need to come out to check for filter clog. With on/off switch on the back of solar panal. Battery Backup --- Works on battery so it has capability of working at night or on cloudy days. Please let it charge up for a couple of hours initially before first use (Note - it only charges in the "ON" position). 5 RGB LED Light --- An added bonus for you. Add extra color to your fountain at night. Filter Bag Included --- To avoid the pump getting blocked with dirt. Multiple Fountain Heads --- change the look and feel of your fountain in minutes.